Imagine walking down a busy city street, turning the corner and coming face to face with the side wall of a large building that’s covered entirely in greenery; such as this one that was recently completed in London. While that may exist today it’s still a concept that I’d like to see further gardening creativity explored and for cities to take the initiative and give it a shot. This future is one I recently talked about in my ‘using urban gardening to improve our cities’ post; leading to beautification of dreary urban areas, helping clear the polluted city air(hopefully improving wellbeing through garden essentially) and bringing back nature to places that don’t have an awful lot of it and hopefully teaching our children about gardening along the way too. That future won’t appear until we start making strides to do something about it though, although there are places that are implementing such green measures, we need to get our garden hand tools out and make things happen. However, as with anything progressive some cities are ahead of others in doing a lot to improve the urban environment, and for those cities I’d say one of the best ways they can start is by creating a few vertical gardens, if you implemented this in your garden it would definitely go a long way toward attracting birds to your garden. Before we get into current examples though let’s take a look at what these vertical gardens actually are. Green walls are either part of a building or free-standing. These walls are then completely or partially covered in vegetation; such as plants, flowers and even vegetables or fruit. 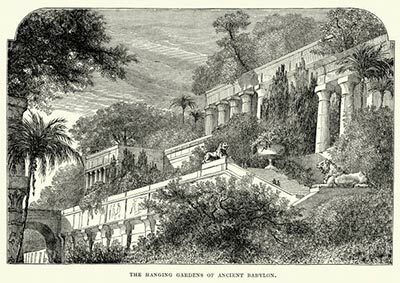 It’s not a modern concept, and can be traced back to the legendary Hanging Gardens of Babylon, but the modern concept was invented by Stanley Hart White in 1938 and later popularised by Patrick Blanc in the late 1980s. We now see all manner of variations with plant pots or self watering troughs simply screwed to the wall in a formation or randomly. Green walls usually come in one of two forms; green facades or living walls. Green facades are made by using climbing plants that slowly clamber up the wall and take root. This can be forced by building a specially designed structure for the plants to grow on, while the plant remains rooted to the ground. Living walls are different in that modules containing high quality soil or other growing mediums are fixed against a wall. The plants are then planted inside them, often supported by an irrigation system that makes sure they are watered regularly without human input. The latter are obviously are a lot harder to install, so these are normally carried out by professionals. This certainly beats your everyday hanging baskets. 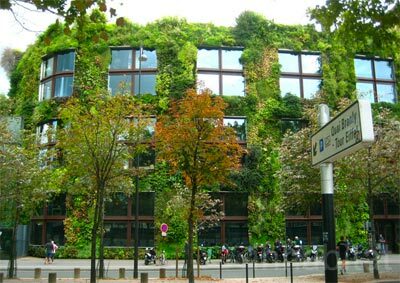 The green wall on the Musée du quai Branly in Paris was designed and planted by Gilles Clément and Patrick Blanc (normally regarded as the father of vertical gardening). It takes up the entire length of one side of a building and looks really lush. However, in winter the wall is affected by direct exposure to north winds blowing in over the waters of the Seine river. Although the support system for the plants’ roots, plus its irrigation and drainage systems, work well on other parts of the wall that aren’t as exposed the area that is tends to suffer frost damage. It’s a pity, because it really is a beauty! There’s not really a lot they can do about this but you can get your garden ready for snow or frost at home. Another green wall designed by Patrick Blanc, on the Madrid Caixa Forum, is a fantastic sight to behold. The building is a former power plant, with the green wall taking up one outside wall at 4 storeys high. Its home to an impressive 15,000 plants belonging to 250 different species and has been flourishing ever since its installation in 2008. The Fiordaliso Shopping Center in Milan has the honour of being recognised by the Guinness Book of Records for having the largest vertical garden in the world. It’s an honour well deserved, as this impressive installation has over 44,000 plants growing over a massive 13,594 square feet. The green wall is made up of metal containers that hold the plants, which are then slotted together like Lego to create the wall – although all this effort cost $1.3 million. They have a serious watering system too. There are plenty more examples, but those are the ones that caught my eye! Can I make a Green Wall in my Garden? Soaks up the water from heavy rain, thus keeping it away from the walls so saves on water too. Provides an extra layer of insulation to a building. This is one of the big reasons why cities are installing green walls, because it helps keep heat inside buildings and cuts down on energy loss. The warmer the building, the less need for heating requirements; so it makes it cost effective to install one. Keeps your home cooler during the summer, as green surfaces don’t store the sun’s energy like brick and concrete walls do. Looks great, you and your guests will be admiring the green wall for years, it simply needs a hedge trimmer or shears to shape it into something beautiful. I prefer shrub trimmers though. Provides a heavenly habitat for insects, which will in turn help wildlife in times of drought. the whole ecosystem will benefit. Improves air quality. Again, this is why cities are installing green walls, and while you might not think the small green wall in the back garden is doing much good this is a case of every little helps! It’s also worth noting that green walls don’t have to be installed on outside walls, they can also be put in interiors too. However, you will need to provide a source of artificial lighting and make sure you keep them well watered. Pouches: Attach pouches to a wall, which can be bought in modular form, and arrange them in rows. You should be able to water these yourself, but it they are too high you can install an irrigation system. Trays: If you’ve ever used nursery flats then it’s a similar process, except you’ll be mounting the tray on your wall instead. The plants are planted in individual cells that are slanted at an angle. It’s a good way of creating that living wall look. 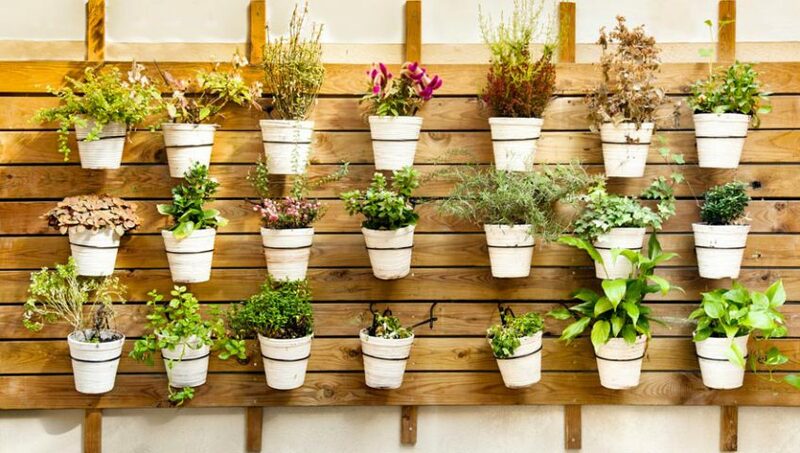 Hanging pots: Attach pots to the wall in rows of three or four, although make sure they’re sturdy enough to cope with winds. Anything: Sacks, old planters and even old rain gutters. Get creative and you can create vertical planters out of a huge variety of things, but the larger the plant you want in there the deeper the space required in whatever you’re using will need to be to allow for more soil. As with a lot of things when it comes to gardening, people are going to have their own ideas. 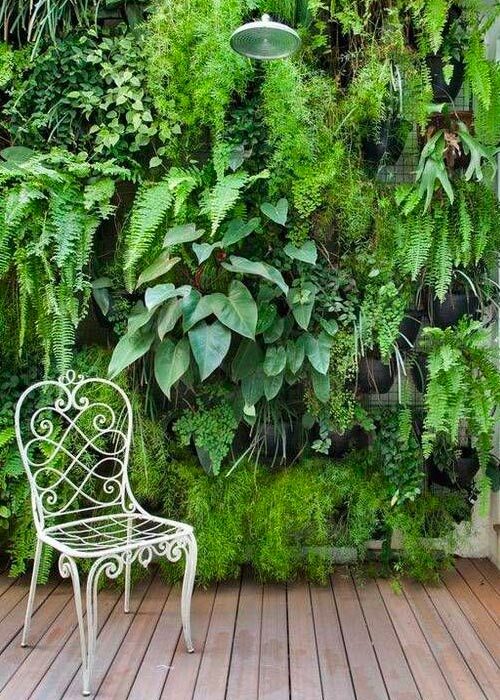 Feel free to share your ideas for green walls and vertical gardens in the comments below. Plus, if you’ve spotted on green wall examples while you’re out and about – or even examples located in your own garden – then please do share the photos with us.